Jefferson Avenue ‘s family tree goes back to 1811, when President James Madison authorized a party to survey and mark a road following the Detroit River and setting aside six thousand dollars to cover the cost of the road. It is fitting that Jefferson Avenue’s roots extend to President Madison, because he was a close friend of Thomas Jefferson, the road’s namesake. The War of 1812 prevented the Indian road provision in the Treaty of Brownstown from being implemented. At the beginning of the War of 1812, General William Hull built a military road across the Black Swamp near Toledo, Ohio and on to Detroit, but the road was poorly built and could not carry even light traffic. It cost the United States Government over twenty million dollars to move a few companies of soldiers from Ohio to Detroit during the War, Consequently, flour brought fifty dollars a barrel at Detroit and after the army and the War of 1812 had passed, brush and trees soon reclaimed the military road. A few years after the War of 1812 ended, the River Road began a second life. In 1817 the approximately 200 troops stationed at Detroit were put to work opening a road from Fort Meigs on the Maumee River through Frenchtown, now Monroe, Michigan. President James Madison and Congress established the road as a military road 66 feet wide and set parameters to lay it out. Congress passed a resolution on April 4, 1818, requesting the Secretary of War to communicate programs and prospects for the completion of the military road. The specifications called for the military road to be 66 feet wide, but the axmen cut an 80 foot wide strip. About thirty miles of the road were completed and General Macomb sketched it, labeling it “The Great Military Highway.” He sent his sketch along with his report, but almost before President Monroe and Congress had received and read the report, brush and trees had converted the road back to an Indian trail. Settlers living in the area and using the road were not content to let it remain an Indian trial and neither were soldiers from the War of 1812. They urged Congress to continue to build the road eastward and appealed to the civil and military officials in the Northwest to continue the road to bring the region into contact with the rest of the United States. They also believed that extensions of the Military Road would open up the Territory to increased land sales and give the farmers and merchants better access to markets for their products. Governor Cass demonstrated that an extension of the Military Road could be made a branch of the Cumberland National Road and bring Detroit into direct contact with the capitol at Washington. Acting on the many appeals for the extension of the Military Road. Congress in 1823 granted land for the construction of a road from the Connecticut Reserve to the Maumee River, finally honoring the fifteen year old agreement with the Indians. Congress appropriated $20,000 to improve the road that the soldiers built from Detroit to Maumee and this appropriation was the first grant that the Federal Government had ever awarded for road building. The Niles Register of October 11, 1823, reported that Father Gabriel Richard, a Roman Catholic Priest, had been elected a delegate from Michigan Territory. Father Richard was well known around Detroit for his efforts at improving roads. At that time his district extended from Detroit to Mississippi. Around 1825 Governor Lewis Cass planned and directed the building of five military highways, called the Five Great Military Highways, in Michigan. These roads radiated in all directions. They were the River Road from Detroit to Perrysburg, Ohio; Michigan Avenue from Detroit to Fort Dearborn in Chicago; the Grand River Road from Detroit to the mouth of the Grand River; Woodward Avenue from Detroit to Fort Saginaw; and Gratiot Avenue from Detroit to Fort Gratiot north of Port Huron. A map of the Michigan Territory in 1825 shows these roads and they are marked as United States Roads. Although they were laid out as military roads at 100 feet widths, they were used primarily for peace and commerce. The River Road was the only one of the five military roads that served as an actual military road and that didn’t happen until the United States entered World War I in 1917. Then the River Road was covered with huge motor trucks carrying war materials from Detroit to the sea. On October 29, 1829, the Legislative Council of the Territory of Michigan authorized a lottery to raise funds to build a road between Detroit and Miami in an attempt to help Congress. This was one of the first examples of local officials working with Congress to bring about improved roads. In the following decades, roads including 122 plank roads in Michigan in 1851 were being built across the United States. Plank or corduroy roads (so called because the adjacent logs were as rough and ridged as a piece of corduroy cloth) were built in Michigan although mud could and did cover plank roads. There are still some traces of corduroy on the River Road buried deep in the ground in the vicinity of Silver Creek. Wagons often had to wallow through the mud to make it to market and stage coaches often got stuck up to their rims on the muddy spring roads. In the days before railroads, stage coaches were often the only way people could travel from one town to another. One of the first stage coach lines to be established was along the River Road to Ohio. Ecorse pioneer Alexander Campau enjoyed the boyhood adventure of riding from Detroit to Monroe and back on the stagecoach which one of his distant cousins drove. He loved the experience of pulling into Monroe at night, hot, dusty and weary and listening to the traveler’s spinning tall tales as he ate supper. The next day arising at dawn to match the stage home, he felt a renewed sense of adventure as he headed to Ecorse along the River Road. The late 18th and early 20th centuries were developing years for macadam, concrete and the automobile. People insisted that macadam and asphalt was bad for horses because they kept falling on macadam and asphalt roads or wearing out their shoes on them. The roads, especially in rural parts of Wayne County, were still impassible during the winter and wet seasons of the year. The Wayne County Road Commissioners submitted their first annual report to the Board of Supervisors in 1907 and requested an appropriation of $5,000 for the maintenance and repair of the River Road. This was the first step toward developing the rural sections of the River Road and during the following year the Board directed the improvement of the first mile of road. The specifications called for a 15 foot wide road made of tar macadam to extend north of the north limits of the Village of Trenton in the vicinity of Monguagon Creek. In 1909, a section of the River Road built of macadam, limestone and crushed cobble was begun at the south limits of the City of Wyandotte and joined to the section built the year before. As the rural sections of the River Road were being constructed, parallel pavement building was also taking place along its length. Workers constructed a brick pavement at River Rouge to join the section of brick pavement already built in Ecorse. Ford City constructed a brick pavement and when this was completed there was a continuous stretch of about 28 miles that extended from the Wayne-Macomb County line to Sibley. There was just one short break in the pavement in the southern end of Wyandotte. Workers built the first section of concrete pavement on the River Road in 1910. In 1911, another three and a half mile section extending south from the south limits of Trenton was built. The city of Wyandotte also built a section of brick pavement one half mile long to close the existing gap. The concrete construction was carried on to the Monroe County Line and by the end of 1912 the total mileage of hard surface road amounted to less than twenty miles. Approximately eleven miles were concrete, two miles were tar macadam and seven miles brick. This provided a continuous stretch of good road from the Macomb County line to the Monroe County line. In the early Twentieth Century road commissioners began to conduct traffic counts on particular roads or a major intersection to pinpoint traffic conditions. The earlier traffic counts showed a definite trend towards motor vehicles. The first traffic count on the River Road was taken in 1912, just outside the city limits of Detroit. The day long count showed that there were 125 horse drawn vehicles, 370 autos, and 13 trucks. A 14 hour count at the same location in 1920 showed 33 horse drawn vehicles, 1,619 autos and 329 trucks. On July 31, 1927, after the River Road had been widened to 72 feet, the count for 14 hours in the Village of Trenton showed 10,450 automobiles, 73 buses and 31 trucks. When Burton E. Loveland arrived in Ecorse in 1919, he opened the first drugstore in the village on faith. At the time there was only one building on the west side of West Jefferson between Salliotte and Josephine and he occupied one of the three store rooms in that building. The rest of the street was vacant and West Jefferson wasn’t even paved. He remembers that stones from the horse’s hooves and from the few cars passing going through his front window. Mabel Plourde remembered the River Road when the spring rains had drawn the frost out of the ground. She saw a big load of lumber come up from the Ecorse lumber yard, drawn by four horses on the River Road, with mud up to the hubs of the wheels and the driver standing on top of the load with the reins in one hand and a long whip in the other, lashing the horses that he could reach. “Tippy” Dickey of High Street remembered when Jefferson Avenue was widened in 1937, checking her information with a 1937 story in the Ecorse Advertiser. The new River Road or Jefferson Avenue, was 90 feet wide with ten inch thick concrete to support the steel laden trucks that rumbled over its surface day and night and the whizzing automobiles whose tires kept the concrete hot. Some Ecorse citizens thought that opening Jefferson Avenue would push sleepy Ecorse village into an industrial and modern age. In the past the road had been an Indian trail through swamp and swale, a military highway, a typical French village squatting on either side of it. On this highway which was shown on the maps of the Northwest Territory as a military highway from Fort Ponchartrain, Detroit to Fort Miami, Toledo there traveled Indians on the warpath, settlers coming into Michigan and soldiers coming to battle with the British. On its middle reaches were fought the massacre of Frenchtown (Monroe) and the Battle of Brownstown. It grew into a narrow tortuous pavement and then a new highway that cost nearly $1,500,000. Several people were responsible for the widening of River Road. The Wider West Jefferson Association organized in 1925 and elected Thomas J. Bresnahan, then mayor of River Rouge as its president. Ecorse Village President Fred C. Bouchard, Hubert S. Amiot of Wyandotte and former president F.C. Affholter of Trenton were on the board of directors and Don Goniea of River Rouge was secretary. Other Ecorse members were F.X. Montie, Earl Montie, I.J. Salliotte, and Christopher A. Raupp. When he became Ecorse supervisor, Frank X. Lafferty worked hard on the project. The Wider West Jefferson Association backed the plan for a 120 foot highway from West Grand Boulevard to Trenton, cost free to the Downriver communities. After a bitter battle against the North Woodward interests, the Wider West Jefferson Association presented its plan to the Wayne County Board of Supervisors. The Board of Supervisors directed the Board of Road Commissioners to prepare plans for the widening. The Wider West Jefferson Association sponsored a community party in Ecorse, called the Greater Ecorse-Wider Jefferson Celebration to commemorate the widening of West Jefferson. They sponsored a parade, selected a queen and there was dancing in the streets. Old Glory flew from every light post. The queen was Miss Eileen Raupp, daughter of Mr. and Mrs. Christopher A. Raupp and 15-year-old ninth grade student at Ecorse High School. She was chosen from 13 other school girls to represent the Village of Ecorse and her ladies in waiting were Helen Pudvan, Irene Cochrane, Betty Navarre and Margaret Spaight. Miss Eileen Raupp, Miss Ecorse, cut the official ribbon opening the River Road, West Jefferson, at the corner of Cherrygrove and West Jefferson. 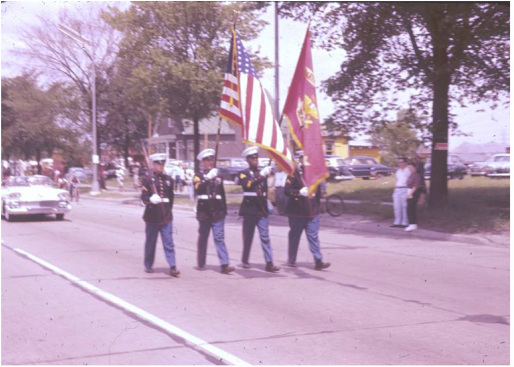 Generations of the Ecorse High School Bands and paraders marched down Jefferson Avenue as did other bands, community and veteran’s organizations and celebrating citizens. The River Road, Jefferson Avenue, rolls on over the horizon and Downriver history marches right alongside.